Take unlimited practice exams pulled from a bank of 200+ sample questions to stay in the game. Quick. Easy. Fast. Expand your skillset and earning potential — become a California Notary with our NEW 6-hour online course. Study online at your own pace. Pass our final exam with unlimited attempts and print your Proof of Completion. PLUS, our one-of-a-kind online Simulated Notary Exams help you master the California State Notary Exam. 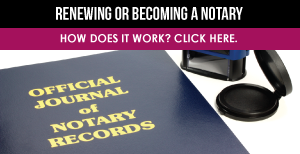 Take unlimited randomly selected practice exams pulled from a bank of 200+ sample questions — topics you need to know to pass the State Notary Exam.